A pair of Senate candidates have emerged from the Louisiana jungle primary, The Associated Press projects, with Republican state Treasurer John Kennedy being joined in a Dec. 10 runoff by Democratic Public Service Commissioner Foster Campbell. Campbell is a rather perennial candidate for congressional seats and a fixture in Louisiana politics, though the race appears that it will not have implications for control of the Senate itself, given Republican wins elsewhere. 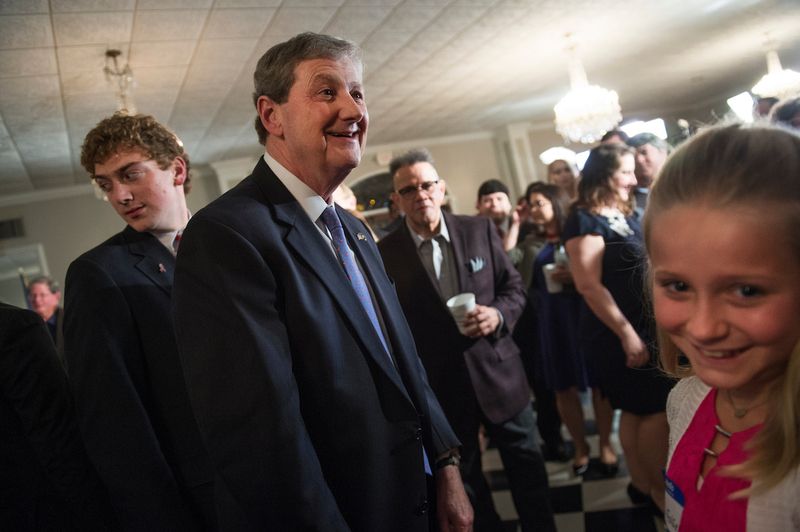 Kennedy led in the primary with 25.2 percent of the vote with almost all of the votes counted. Campbell was safely in second with 17.2 percent. Coming into the race on Election Day, the Rothenberg & Gonzales Political Report/Roll Call rated the race Safe Republican. In 2010, David Vitter beat Democrat Charlie Melancon with 57 percent of the vote. Tied or nipping at Campbell’s heels in several surveys had been Reps. Charles Boustany Jr., and John Fleming. But the two sitting House members fell short. Fleming is a founding member of the conservative and often anti-leadership House Freedom Caucus. Kennedy is relative newcomer to the GOP and was a fixture in Louisiana Democratic politics before that. He joined the Republican Party in 2007, when former George W. Bush adviser Karl Rove nudged him to switch parties in a failed effort to unseat then-incumbent Democratic Sen. Mary Landrieu. In an earlier 2004 Senate run, Kennedy endorsed Democrat John Kerry for president while assailing the Bush-era tax cuts. He now says that the Kerry endorsement was a big mistake and that the Democratic Party has become too extreme for his liking. The Louisiana Senate seat became open after GOP Sen. David Vitter opted to not seek re-election after an ill-fated bid for governor. The state’s current Democratic Gov. Jon Bel Edwards has been backing Campbell. Campbell has promised to be a “powerful partner” to Edwards in the effort to secure federal funding to help with the aftermath of catastrophic flooding that hit Baton Rouge in August. Campbell has also said he looked to Edwards’ successful run for governor as an example for a socially conservative Democrat seeking election in a state that has recently preferred to elect Republicans.